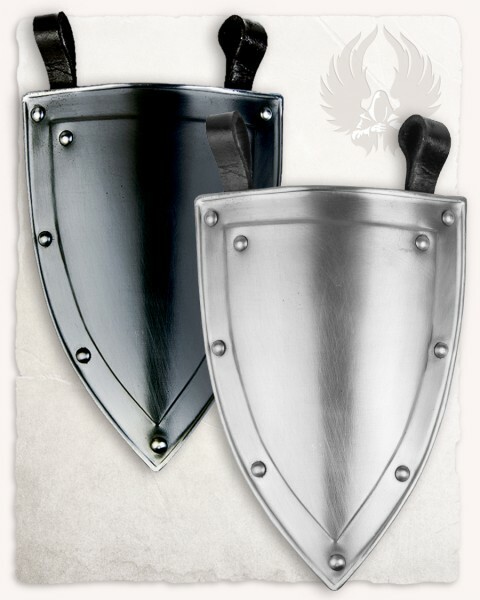 Matching the "Balthasar" series, this shield is decorated with rivets and a beading along the edge. It is worn on a belt by using the two loops on the top to hoist it through there. Naturally it can be worn as a tasset, when fastened on the upper thigh. This way you will have an additional plate armour piece. The belt shields, just like our arm shields, cry out to be painted, modded and to be combined with existing clothing. This is, where your creativity and immagination comes into place. Talking of creativity: We suggest to clean the shield with Acetone prior to üainting it. Afterwards just sand it with a paper with 600 grid. Use some automobile colour primer as the colour-matching foundation. When the foundation is fully dried, you should sand it again and apply a second layer of colour. Now is the time, where you can paint your details, like heraldry, animals and writings with weatherproof acrylic paint.